If you’re looking for a better way to get around on your beach vacation and bicycling just seems like too much work, why not rent a golf cart! A rented golf cart will be far cheaper to get around in than driving your car. Following are some of the local golf cart rental companies that will meet your needs no matter what size/type of golf cart you want. 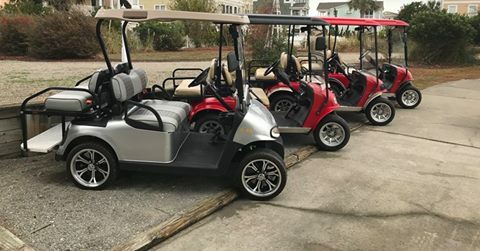 The premier manufacturer of the street legal golf cart “Island Cart” — a Low Speed Vehicle (LSV) in Southeastern North Carolina. Offering parts & accessories, batteries, repairs, and custom built golf carts to meet your needs. Rents Street Legal and Standard Golf Carts by the day, week and month. Free delivery and pickup to Holden Beach. 4 and 6 passenger, street legal, golf carts available for 3 days, weekly or monthly rentals. Peak season rentals from June through August, require a minimum 7 day booking. Three day rentals are available September through May only. To book a 3 day rental please contact the office directly. 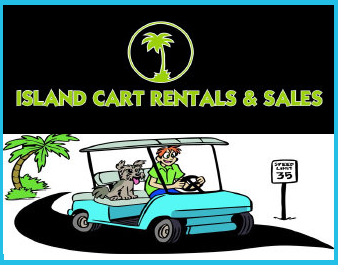 Golf cart rental for Southport, Oak Island, Holden Beach, Ocean Isle and Sunset Beach. Also available are beach tent rentals and corn hole boards. Off-season weekend rentals are $100 for Saturday and Sunday Phone 910-444-8846. Offer expires May 20, 2018.